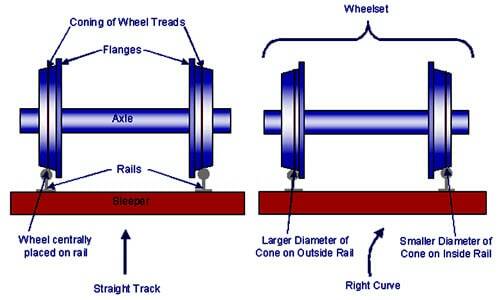 The Surface of wheels are made in cone shape at an inclination of 1 in 20, and the same slope is provided in the rails (see fig), this is known as coning of wheels. The diameter of wheel is different at different cross section of the wheel, when the train running on the straight track try to move in any direction, the diameter of the wheel increases over one rail and the wheel assembly is automatically forced to move back in its original central position due to difference of distances moved over two rails. whereas on a curved track, due to centrifugal force the train is forced in outward direction, the diameter on outer track increases and the distance on two tracks are adjusted. To keep the train in its central position of the rails, coning does not allow any sidewise movement on a straight track. to allow the wheels to move different distances on a curved track and thereby reduce wear and tear.